The tumble in cryptocurrencies that erased nearly $500 billion of market value over the past month could get a lot worse, according to Goldman Sachs Group Inc.’s global head of investment research. 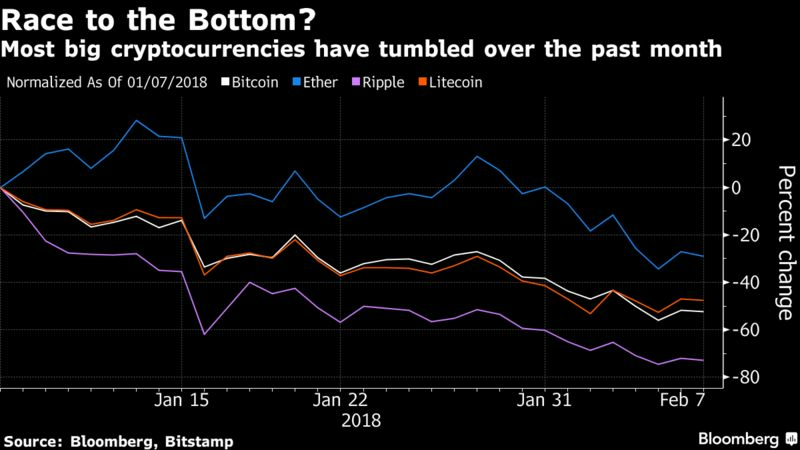 Most digital currencies are unlikely to survive in their current form, and investors should prepare for coins to lose all their value as they’re replaced by a small set of future competitors, Goldman’s Steve Strongin said in a report dated Feb. 5. While he didn’t posit a timeframe for losses in existing coins, he said recent price swings indicated a bubble and that the tendency for different tokens to move in lockstep wasn’t rational for a “few-winners-take-most” market. Today’s digital coins lack long-term staying power because of slow transaction times, security challenges and high maintenance costs, according to Strongin. He said the introduction of regulated Bitcoin futures hasn’t addressed those concerns and he dismissed the idea of a first-mover advantage — noting that few of Internet bubble’s high fliers survived after the late 1990s. Strongin was more upbeat about the blockchain technology that underlies digital currencies, saying it could help improve financial ledgers. But even there he sounded a note of caution, arguing that current technology doesn’t yet offer the speed required for market transactions.